Despite the many accomplishments of Black History Month’s goals, its often secular narrative forgets the contributions of Black Catholics. In recognition of that, the National Black Catholic Clergy Caucus of the United States began observing November as national Black Catholic History Month nearly 30 years ago. Nonetheless, in order to promote awareness of the accomplishments of all black Americans, it is important to promote an awareness of some of the many Catholic individuals who have achieved greatness in the face of racism’s plight — and in many cases the supreme greatness of holiness. No national celebration of Black History Month would be complete without including these Catholic stories — or the countless stories of black Catholics left untold. Michael R. Heinlein is editor of Simply Catholic. Email him at mheinlein@osv.com. Follow him on Twitter @HeinleinMichael. Not much is known about the first half of Mother Mary Lange’s life. The Oblate Sisters of Providence broadened their mission from its origins in schools under the leadership of Mother Mary Lange, eventually serving in a variety of educational and social capacities, including helping young women develop careers and operating homes for widows and orphans. Lange died in Baltimore on Feb. 3, 1882. The formal investigation into her holy life was opened in 1991 by then-Archbishop (later Cardinal) William H. Keeler of Baltimore. Father Augustus Tolton knew what it meant to be abandoned and unwanted. Born the son of slaves, Tolton went on to be ordained the first African-American priest from the United States. But the path was not easy. He had to overcome many obstacles, including rejection from seminaries because of his race. His family made a harrowing escape into Northern territory, settling in Quincy, Illinois. Father Peter McGirr, pastor of St. Peter’s Church in that city, took the young Augustus under his wing, granting him entrance to his parish school against the wishes of many in the parish. As a student at Qunicy College, Franciscan priests assisted Tolton as he sought the priesthood despite finding many doors closed in his face. Father Tolton’s arrival in his hometown — about 20 years after the end of the Civil War — was met with racial prejudice by laity and clergy alike. The bishop’s delegate even told him white people should not attend his parish. 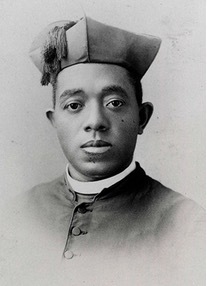 Father Tolton persevered in humility and obedience and was eventually granted the opportunity to minister in Chicago by Archbishop Patrick A. Feehan in 1889. In the Windy City, Father Tolton provided priestly care to a growing black Catholic community, which formed into St. Monica Church. He poured out his life in service to his people — in care for the poor and in a church building project, among other things. This strenuous work undoubtedly was a contributing factor to his death at the age of 43. After returning to Chicago by train from a retreat, Father Tolton collapsed in the street on a hot summer day and died on July 9, 1897. Another step forward toward Tolton’s canonization was taken in December, when his remains were exhumed at his grave in his adopted hometown of Quincy, Illinois. First recognized black bishop in the U.S. In the midst of the racial tumult of the 1960s, Bishop Harold Perry was named an auxiliary bishop in New Orleans in 1965, the same year as the Selma to Montgomery march. 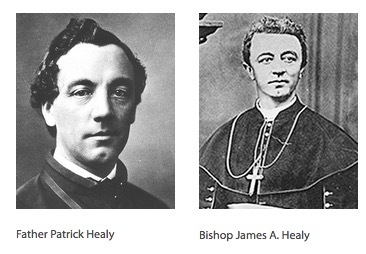 He was the first black bishop in the United States to be recognized as such; technically, the first was the biracial Bishop James Healy, who identified mostly with his father’s Irish heritage. Ordained a priest for the Divine Word Missionaries in 1944, Bishop Perry became the 26th black priest ordained in the United States. After several years of pastoral work throughout the South, he became rector of the seminary operated by his order — originally founded to prepare African-American men for the priesthood. 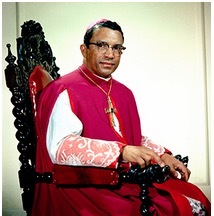 New Orleans Archbishop Francis B. Schulte said of Bishop Perry at the time of his 1991 death, “he was a symbol of the great changes which have taken place in our Church and in our country.” Since Bishop Perry’s time, 23 African-American priests have followed in his footsteps and have been ordained bishops in the United States — including another of the same name: Chicago Auxiliary Bishop Joseph Perry (no relation). 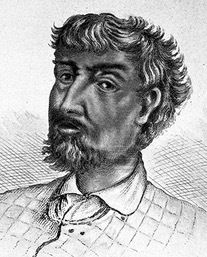 Having lived in what would become America’s “Second City” during the 18th century’s last decade, Jean Baptiste Point du Sable is regarded as Chicago’s first settler. Not much is known about him before that, though historians claim the fur trader once had been arrested by the British on the Indiana frontier for charges of colonial sympathies. It is said that the free du Sable survived the threat of enslavement, having lost his identification papers, by taking refuge in a Jesuit mission once he arrived in America. 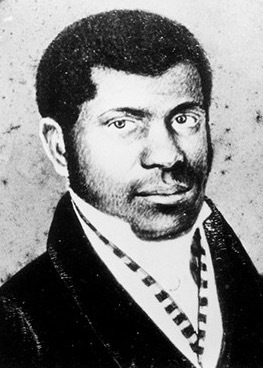 Believed to be from Haiti, it’s believed that he came to America by way of France, where he had attended school. While these details lack much documentation, surviving documents prove that du Sable married his wife of Potawatomi descent in the presence of a Catholic priest, and his funeral was held in a Catholic church in suburban St. Louis in 1818. In 1990, Cardinal John J. O’Connor of New York moved the remains of a black Catholic layman to a niche in the Bishop’s Crypt at St. Patrick’s Cathedral in New York City. It was a stark contrast from the days when his race prohibited him from entering Old St. Patrick’s Cathedral in the city. 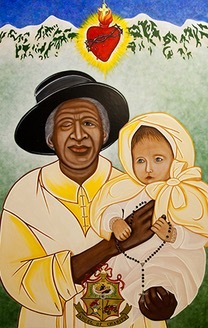 Venerable Pierre Toussaint was the first and, to date, only layman to receive such an honor; the move was meant to foster devotion to his life and witness to the Gospel. Toussaint left a legacy of selflessness and charity. Pierre Toussaint was born into slavery in modern-day Haiti and received his freedom in 1807. After arriving in New York City, he became successful as a hairdresser — earning a sizable salary, he saved his income to purchase his sister’s freedom as well as that of his future wife, Juliette. The couple offered their lives to God in care of the poor and needy. Together they adopted Pierre’s niece and provided for her education. They fostered and housed several orphans in their home over the years, and they were dedicated to doing works of charity throughout the city. The Toussaints also offered much assistance to help their wards learn trades, in addition to operating a credit bureau and providing a shelter for immigrant priests. Pierre boldly crossed barricades to nurse the sick and destitute during a cholera outbreak. When urged to retire and enjoy his remaining years, Toussaint is quoted as saying, “I have enough for myself, but if I stop working, I have not enough for others.” He attended daily Mass for more than 60 years until he died in 1853, two years after his wife. Flickr.comDr. Lena Edwards was born into a devout Catholic family in Washington, D.C., in 1900. The mother of six children, Edwards pursued a medical career as a means to help people. The Catholic obstetrician was vocal in her opposition to abortion and sterilization and advocated natural childbirth. 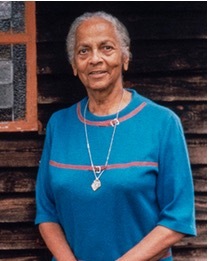 In her day, she worked among the poor and immigrants and taught at the Howard University Medical School. A consummate and successful professional, Edwards was awarded the highest American civilian honor in 1964 by President Lyndon B. Johnson — the Presidential Medal of Freedom. A devout Catholic all her life, Edwards was a daily Mass attendee. Born on the feast of St. Francis of Assisi, Edwards was very much devoted to him and the virtue of poverty. She was a professed secular Franciscan and was awarded the Poverello Award in 1967, given to those who exemplify the ideals of the Franciscan founder. She died in 1986. In the 19th century, a family of black Catholics attained many “first” accomplishments in the Church in the United States, although most people didn’t know they were black. That’s because the nine Healy children were born of a common-law marriage between a biracial slave and an Irish immigrant plantation owner in Georgia. Of them, three became priests — all of whom were trained in Paris, but controversially did not widely identify as black in their lifetime. One became the first black president of a Catholic university in the United States — Jesuit priest Father Patrick Healy of Georgetown University. Father Alexander (Sherwood) Healy was a canonist who died at 39 in Boston. The oldest son became the first American bishop of African-American descent — Bishop James Augustine Healy, second bishop of Portland, Maine. Three daughters became nuns with the Congregation of Notre Dame — the order founded by St. Marguerite Bourgeoys in Montreal, Quebec. 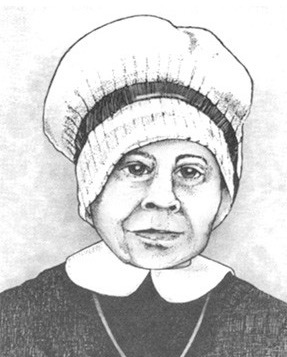 Sister Eliza Healy, CND, became the first superior of African-American descent in a religious community in the United States. Daniel Rudd was a black Catholic layman who sought to bring about racial equality in Catholic parishes throughout post-Civil War America. Born into a Catholic family — his father was a former slave — Rudd founded a weekly newspaper in 1886 for black Catholics in America as a means to harmonize racial divisions in the Church. His aims were to make the Catholic Church known to a wider audience of African-Americans, but also to break through the racism of his day. With his pioneering work, Rudd challenged the conscience of a nation and his Church. 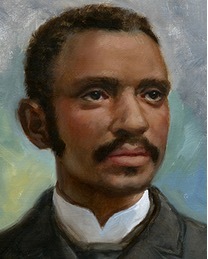 Eventually his work achieved the establishment of the first National Black Congress in 1889 — at which Father Augustus Tolton was the main speaker. Born into slavery in Hannibal, Missouri, Julia Greeley first went to Colorado with the family of the first territorial governor, William Gilpin. She gained her freedom after the 1863 Emancipation Proclamation. As a slave, a beating resulted in a drooping eye. While in Colorado, Greeley fell in love with the Catholic faith. Converting in 1880, she immediately immersed herself in the devotional and sacramental life of the Church; she attended daily Mass and took up intense fasting, along with constant prayer. Greeley found great joy in her love for the Sacred Heart of Jesus, which she saw as the font for her many charitable and service-oriented ministries. She was known to spread the devotion, even using it as a tool to evangelize Denver’s firemen. The love she had for Jesus’ heart was expressed in her own merciful love for all she encountered. Greeley took on a life of poverty, living in union with the poor of Denver. Taking on odd jobs like cooking and cleaning, she used her meager salary to finance a ministry to the poor. In her trademark floppy hat, the holy woman dragged a red wagon filled with goods to distribute to her city’s poor. At times, she even took to begging for them. A witness of God’s love and mercy to all, Greeley’s life shows the dignity of every life — especially those on the peripheries. Many of those whose lives she touched were among the nearly 1,000 mourners at her funeral in 1918. The canonization cause of Greeley was recently advanced by the U.S. bishops. In her teenage years, she became influenced by the religious sisters with whom she taught alongside since she was 14. Though she believed she was called to religious life, two communities denied her entrance because of the color of her skin. Not deterred by rejection, though, Delille’s resilience brought her to establish a religious congregation herself in 1836. With the funds inherited at the time of her mother’s death, Delille began what became known as the Sisters of the Holy Family. The order’s original mission was to serve the poor and sick and provide religious education to both slaves and free persons. Her generosity and love was known to everyone who knew her. Sacramental records show Delille served as the godmother and marriage witness of many. Delille died at the age of 49 on Nov. 16, 1862, having spent her young life in love and service of others. 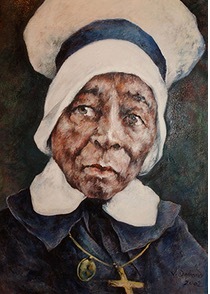 Delille’s cause of canonization opened in 1988, and she was declared Venerable in 2010. 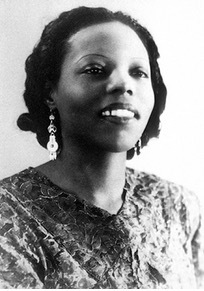 Life as a globetrotting musician caught up with Mary Lou Williams while performing at a Paris nightclub in 1954. The jazz pianist and composer later said that the “‘greed, selfishness and envy” she saw in her life caused her to get up and walk out that night mid-performance and leave her career. “I got a sign that everybody should pray every day … I had never felt a conscious desire to get close to God. But it seemed that night that it all came to a head. I couldn’t take it any longer. So I just left — the piano, the money, all of it,” she said. She spent the next three years in something of a contemplative state, passing the majority of her days in prayer at a Catholic church near her New York City apartment, which she loved because it was the only church she could find open at all hours. After converting to Catholicism in 1957, Williams was a changed woman. Williams returned to music at the urging of many friends, including priests and jazz legend Dizzy Gillespie. Her revived career reflected her new-found faith and included a mix of teaching and composing — including three Mass settings and a well-known piece honoring St. Martin de Porres. “I am praying through my fingers when I play,” she said. “I get that good ‘soul sound,’ and I try to touch people’s spirits.” Williams died in 1981. November’s designation as Black Catholic History Month provides the opportunity to focus on the numerous of contributions Black Catholics have made to the Church in America. Many Black Catholic figures who have left an indelible mark, particularly the four figures who are of African-American descent on the path to canonization. With ties to Baltimore, Chicago, New Orleans and New York, the heroic lives of virtue and ministry of Servants of God Augustus Tolton, Mary Lange and Venerables Henriette Delille and Pierre Toussaint illustrate the holiness of the Black Catholic community in America. The daughter of a Frenchman and a free woman of color, Henriette Delille lived out her days in New Orleans’ French Quarter. As a young woman, she advanced in the ways of high society — schooled in French literature and instilled with a penchant for music and dancing. Her mother’s aim had been to groom her as a suitable candidate to enter into a common-law marriage situation where mixed race women weren’t considered fully spouses to their European husbands — the colonial system called plaçage. It seems as though she rejected the idea, since no record exists. However, some parish records indicate that she may have had two sons who died in infancy, although it is uncertain. What’s clear, though, is that, after her confirmation, Henriette was changed. She desired religious life, but was denied by two communities because of her skin color. In her teenage years she became influenced by the religious sisters with whom she began teaching alongside of when she was 14. 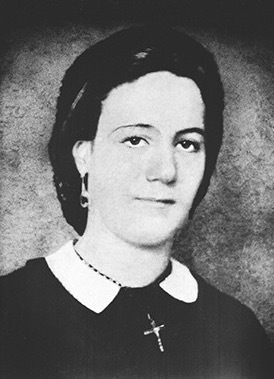 Henriette began her own religious congregation in 1836 — eventually known as the Sisters of the Holy Family — by utilizing the inheritance received following her mother’s death. The order’s founding mission was to serve the poor and sick and provide religious education to free and enslaved alike. Henriette also was known to be the godmother marriage witness of many, including both slaves and free. After spending herself in love and service of others, she died at the age of 49 on Nov. 16, 1862. 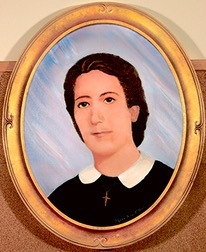 Little is known about the early life of Mother Mary Lange. Likely of what’s today Haitian ethnicity, Lange emigrated from Cuba shortly after the War of 1812 and made her way to Baltimore where she ran a school for African-American children in her home. Sulpician Father James Joubert had been instructing Sunday school for Black Catholic children and recognized that many of them, particularly girls, were unable to read or write. Because of this, he sought to open a school for girls and asked Lange and another woman to not only operate the school but also to start a religious order to staff the school. With that, the Oblate Sisters of Providence were born. Under the leadership of Mother Lange, their mission grew from simply running schools to offering career development classes for women and to operating homes for widows and orphans. She died in Baltimore on Feb. 3, 1882. Pierre Toussaint is remembered for a life of selflessness and charity. 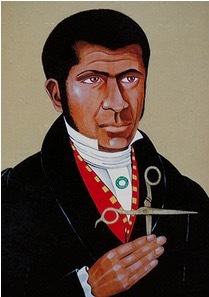 He was born into slavery in modern-day Haiti and received his freedom in 1807. After emmigrating to New York City, he became successful as a hairdresser — earning a sizable salary, he saved his income to purchase his sister’s freedom as well as that of his future wife, Juliette. The couple offered their lives to God in care of the poor and needy. Together they adopted Pierre’s niece and provided for her education. They fostered and housed several orphans in their home over the years, and they were dedicated to doing works of charity throughout the city. The Toussaints also offered much assistance to help their wards learn trades, in addition to operating a credit bureau and providing a shelter for immigrant priests. Pierre boldly crossed barricades to nurse the sick and destitute during a cholera outbreak. He attended daily Mass for more than 60 years until he died, two years after his wife, on June 30, 1853. 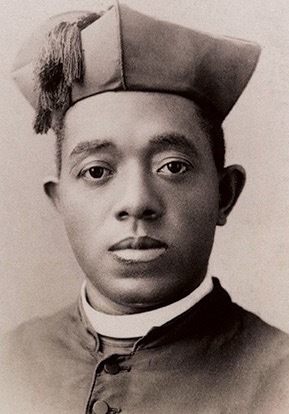 The son of slaves, Father Augustus Tolton went on to be ordained the first priest from the United States to be recognized as African-American. His family made a harrowing escape into Northern territory, settling at Quincy, Illinois. The pastor of St. Peter’s Church in that city — Father Peter McGirr — took the young Augustus under his wing and allowed him to enter the parish school against the wishes of many in the parish. Regrettably, no American seminary would accept Tolton, and he would go on to be ordained in 1886, after attending the Pontifical Urban College in Rome. His expectation was to serve as a missionary to the African continent, however he was assigned back to the United States. Father Tolton’s arrival in his hometown was met with racial prejudice by laity and clergy alike — with the bishop’s delegate telling him he was not to allow white people to attend his parish. Father Tolton persevered in humility and obedience, with greatest of virtue, but was eventually granted the opportunity to minister in Chicago by Archbishop Patrick Feehan inn 1889. In the Windy City, Father Tolton provided priestly care to a growing Black Catholic community, which formed into St. Monica Church. He poured out his life in service to his people — in care for the poor and in a church building project, among other things. This strenuous work undoubtedly was a contributing factor to his untimely death at the age of 43. After returning to Chicago by train from a retreat, Father Tolton collapsed in the street on a hot summer day and died on July 9, 1897.